I found a company on Ebay that sells authentic Lucky Mojo brand items. The company is called Black Cat Root Shack. Does anybody know about this company? How can we tell if a company is an "authentic" reseller? While I can't guarantee everything will be fresh, I still placed a small order and will drop a line when I get it to let you know how it turns out. I am hoping it will be a resource where I can get products faster as I know LM sometimes gets pinched by the supply and demand entity of success. the page there is information about them being an authorized LM reseller. And they most certainly are. These authorization icons can be copied of course, so good of you to check it here before buying. Yes indeed Black Cat Root Shack is authentic, I believe Lara, one of this forums admins, is the proprietor. Well, Jorge Diaz, the owner, did purchase a lot from us a year ago. He was also the one who started us on the photos -- all those cute little pictures of the bottles are his! -- and we traded him product for al his good work, but he has not made a recent order and is no ;oger one of our auhorized resellers. Hello all! This question is generally posed to Miss Cat or anyone who knows about LM Licensing, because a few days ago one of my friends emailed me this link: http://myworld.ebay.com/blackcat-rootshack/ (which was where she thought I was buying my LM products) The seller claims to be a licensed LM seller, and having never heard of LM doing this, I wanted to make sure that this seller was legit. I figured either she was, and no harm no foul, or she wasn't and it needed to be brought to the attention of those in charge. Thanks for taking the time, everyone! Miss Lara's ebay store is licensed, and she's an AIRR rootworker. She ships really quickly, too, if you need something in a big hurry. When I google I see a lot of other folks carrying LM products. How do I know which of these is approved of by LM themselves or if they are rip offs ? Does this site have a listing of authorized re-sellers? Here's the list of Lucky Mojo retailer's, if you know of someone NOT on this list who claims to be selling LM products, please post the link here. Thanks! But I was wondering, Would Ebay protect my privacy???? I am an in the broom closet practicer. I live with 3 other people, when they see the box from Ebay the last thing it needs to say is blackcat-rootshack or Lucky Mojo Hoodoo Spell Kit. Would buying Lucky Mojo products from Ebay give me 100 percent privacy? Even from the 3 people that live with me who will most likely read it? Thats something to take up with the proprietor of that particular Ebay shop. This forum is to help people chose and use Lucky Mojo products, we aren't technical support for Lucky Mojo or their retailers. Email the shop owner and ask about discreet shipping options. Black Cat Root Shack is a licensed distributor for Lucky Mojo products - so you need to take your questions up with the owner of Black Cat Root Shack as they are completely independant from Lucky Mojo. I know that Lucky Mojo will pack things discreetly if you ask them to, so I imagine that if you ask, Black Cat Root Shack will do the same. But you need to contact them directly. Lucky Mojo can and will send packages discreetly to you. The box will NOT say LMCC-it has a person's name instead. It will be just a plain box with nothing on the outside displaying your order. Yes, but she was asking about an independent distributor. For that she needs to contact them directly to see what their policies are. They are not LM. That's OK. Re-reading the question, the original poster was a bit confused too. I only understood it because I was already familiar with the site. But basically, when you're ordering from them, you're not ordering from Lucky Mojo or from eBay, you're ordering from Black Cat Root Shack. Contact them directly for more help. robynrawr wrote: Lucky Mojo can and will send packages discreetly to you. The box will NOT say LMCC-it has a person's name instead. It will be just a plain box with nothing on the outside displaying your order. this is regarding the LM privacy aspect: when u place an order with them at their shopping cart, there is a box that asks you what kind of shipping you need, and you can choose the discreet option. There was the one time when i forgot to pick that option, but as a rule i mention it in the body of message box ALSO that is at the bottom of the ordering page, where you put in any instrutions or choices etc you might have. When that parcel came it was discreet shipping so i kinow they read the message box and followed those requests as well. They are very busy and may not have time to answer emails for days at a time....but they are worth it though. Since the black cat root shack is a authorized LM dealer i am pretty sure they will do the same, and u might get a reply earlier as they are (probably) a smaller and less busier store. Thank you so much for your help. I decided that I am not going to buy from Ebay. I am going to buy from the official Lucky Mojo page. And thanks for explaining how to place and order and how to get the discreet option. Truth be told, I found it VERY confusing. It is confusing at first but gets much easier. Call the shop if you have a quick question; they will also advise you on which candles/spell kits, and they have always been VERY helpful to me. And you can order on the phone as well. I thought I saw this the other night when doing some online window shopping and then let it slip my mind. But it came up again today in a search I was doing. It seems that a few LM supplies are for sale on the Indio Products website, not really represented as such, and that seemed odd to me. Just want to point it out in case this isn't an approved business arrangement LM has with Indio. If it IS, my apologies for butting in. Just lookin' out for LM and cat! Thanks for watching out for us! You are so nice! Yep, we sold those kits to Indio at wholesale and they can resell them. Capitalism: It's kinda cool, in a rough and tumble way. This is a list of approved resellers. The list that starsinthesky provided is a list of official retail resellers of Lucky Mojo--but in order to be on that list each merchant must have a brick and mortar shop where people can go and visit. There are many folks who resell Lucky Mojo products online legitimately and are not on that list. Your best bet is to call the store to find out if the online purveyor you are interested in is one of the resellers. sorry for not using the appropriate forum but i am new here. I have bought some lucky mojo spell kits from 13 moons is that a legit place to buy lucky mojo products? Yes, 13 Moons carries our products. Nice folks. Hi where can I buy a good altar table? is it ok to buy old altar tables? wat is a good wicca or hoodoo school? yesitsme wrote: is it ok to buy old altar tables? Both of your questions are off-topic for this forum. This forum is here to help people chose and use LuckyMojo spiritual supplies. LuckyMojo does not sell "altar tables" old or otherwise. You do not need a special table for an altar in any case, the top of a nightstand works well. yesitsme wrote: wat is a good wicca or hoodoo school? See above, this forum has nothing to do with the Neo-Pagan religion of Wicca; this is not the place to ask about any facet of that tradition. Also, why are you looking for a "a good wicca or hoodoo school?" They are completely different things, one will not teach you the other. Well, thanks. I sure do know Caroline, Stitich, and the others there. I wish i was a enough of a "big deal" for them to become regular wholesale customers of mine. I've tried, and i even helped them once with their web site, but they don't seem inclined to carry our products. Too bad, too, because there are lots of folks we ship to in Chicago who would love a real local outlet for Lucky Mojo products -- it would save them having to pay the shipping charges, the products would be right there in a store for them to smell-test, and the store-keeper would make a nice mark-up on the products with no work, and only a $150.00 minimum order each time. Plus, we would promote their store via our own site and they would have free use of all our product pictures for their site. It's a good deal and dang generous on our part ... but they've never taken us up on the offer. Yeah I agree with you. I haven't met Caroline, I've heard of her, but I always happen to only drop in on the days Stitch is there. Maybe it's fate. There aren't very many metaphysical shops in Chicago surprisingly. They have some of your stuff on hand. I told them they should have more of your stuff because it would make it easier for me! Hmm, if I move back to Chicago, I would totally take on the role of helping you sell stuff in Chicago I just love how your stuff really works. I'm in the process of going online to do my readings and sell Lucky Mojo products. If I do well, I'll start a physical shop north of Seattle. I hope to see you all there! I love the quality of Lucky Mojo products but would like to purchase them locally. I noticed there aren't any UK retailers on the list of Lucky Mojo Retailers but overheard the list only contains shops with a physical location. Are there any reliable websites in the UK that sell Lucky Mojo products? Not that i know of, Addi123. I have actually bought from Black Cat Rootshack multiple times, and they are nice, fast and legit. Im in uk and so i used a site called pagan-magic.co.uk to buy the Lucky Mojo products follow me boy, attraction, love me and fire of love oils amongst other things. Pagan Magic, operated by Dawn Gribble in Devonshire as pagan-magic.co.uk online is an authorized Lucky Mojo reseller. They also sell other brands of goods. For the items that have Lucky Mojo labels and for which they are using graphics from our web site, they are selling actual Lucky Mojo oils. They have placed 18 large wholesale orders with us to date. Lara's Black cat Root Shack is indeed an authorized Lucky Mojo reseller. She is a forum admin here, and works for Lucky Mojo on IT projects as well. She's also a great friend and compatriot of yours truly. Thanks for asking and to all who responded to the question -- i am touched by your concern for quality and authenticity. Oh thank you so much Cat for this, really appreciated. Im assuming the colours of the oils vary. Will check out the list hope to find some other uk sellers other then pagan-magic. But glad to know my oils are authentic and bought direct from you. Thanks to everyone who responded. Vescha has the lucky mojo symbol but when I click on it it's not a link..also it's oddly placed.. just asking. Vescha is a graduate of my course and is therefore allowed to use the Lucky Mojo Certified Pracititoner logo -- but she has set herself up in competition with me and she does not sell Lucky Mojo spiritual supplies, nor does she mention my name as a teacher of hers. So the answer is -- "NO, this is not Lucky Mojo. It's a graduate of my course doing her own thing." In fact, that logo -- which was designed by Lara, for use in this forum, and by our retailer-resellers -- makes me think i ought to create a different logo for graduates -- because Lucky Mojo is NOT the one teaching the course, it's ME doing that, so the graduates should have some sort of HRCC Graduate logo unless they are actually affiliated with my Lucky Mojo products. That's not Vescha's fault though -- it's just the way the logo was designed. Dang, i wish Lara was around -- she's really good at that kind of stuff. I can do i myselfr, i suppose, but i do miss her sharp ways around Photoshop! Okay, well, anyway, that's your answer. There is the Certified Practioner logo and there is the Authorized Reseller logo. Any graduate of Catherine's course is entitled to use the Certified Practitioner logo. 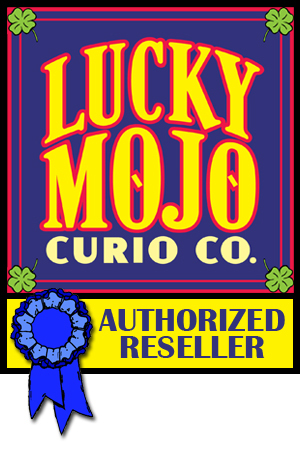 The Authorized Reseller logo is for licensed business owners selling Lucky Mojo products, such as Lara and myself. They do not carry all of the products that lucky mojo does, but if you just want a few oils, then these resellers are great. Re: Lm oils or are they???? Only physical stores are listed on the retail page at Lucky Mojo. There are a lot of online stores that sell LM products also. I have recently ordered from Pagan Magic. They are for real. I concur! I am in New Zealand. Is there anyone to help me please. Houngan Liam (on this forum) is in New Zealand and carries a limited stock of Lucky Mojo supplies. We ship directly to New Zealand if you need something he does not have in stock.